After the mild huge success of the All-80's Team, we're back to look at the players from a decade later. Oh the '90's. What a strange new world it was. Baseball cards were becoming glossy and overpriced. A strike cancels the 1994 World Series (Sorry Montreal!). And of course who can forget the homers, homers, homers?! One issue I noticed with the All-80's Team is that there was very little argument in the polls. So to make it more interesting and spark a little more debate, I've decided to combine both leagues instead of doing separate NL and AL features. This will also keep it from dragging on well into August. As always be sure and vote for your choice in the poll in the left sidebar. 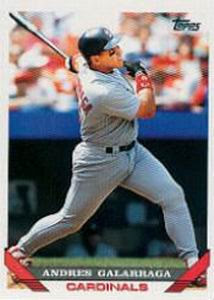 It was a neck and neck battle, but in the end, Ivan Rodriguez was declared the All-90's catcher. Now we move on to a much more debatable position, first base. I had decided at the start of this, I would keep each position to no more than 8 candidates (except for starting pitcher of course). Only problem was, there were too many good players to consider for first base. So in this case, I have expanded it to 10. Apologies to Will Clark and John Olerud who just missed the cut. 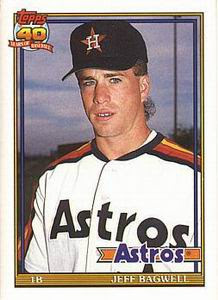 Notes: In 1990, the Boston Red Sox traded a spry young kid named Jeff to the Astros for Larry Andersen. While Larry pitched OK for Boston during their ill-fated playoff run, the folks in Houston were laughing all the way to the bank as they now had their first baseman for the rest of the decade. To be fair to Boston they did already have a 1B that was drafted the same year as Bags. A portly fellow that we'll get to in a little bit. 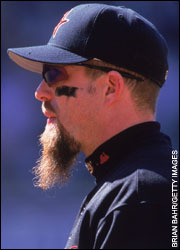 Bagwell won the MVP in the strike-shortened '94 season, hitting 39 home runs and 116 RBI in only 400 at bats. 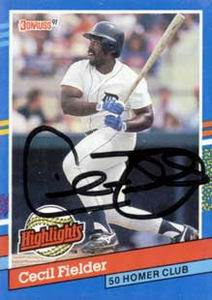 Notes: I remember when Cecil hit 51 homers, it seemed like such a tremendout feat to me as a kid. Keep in mind the last time someone had hit 50 was by George Foster before I was born. 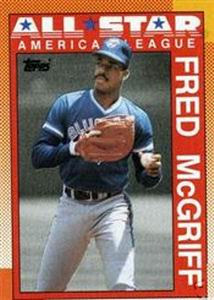 Big Daddy had some monster slugging seasons in the early 90's, leading the AL in RBI three years in a row from 1990-92. Notes: I'm not denying that Big Cat wasn't a great hitter, but he is easily one of the best case studies for the "Coors Factor" than any. A guy that never hit 30 home runs in his career shows up in Denver at 32 years old and proceeds to rattle off 4 straight seasons of 30+ homers with the Rockies. One thing that helps his case is that he hit 44 homers with the Braves in 1998 before missing the 1999 season due to cancer. Notes: What can be said about Grace that we haven't said already? A Wrigley fixture at first base for the entire decade. If you want to read more, check out an old column we wrote at Goatriders on why his number should be retired. Notes: I drew the ire of the Governor when I first mentioned leaving Karros off. 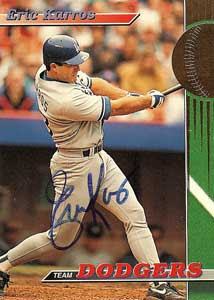 Karros was solid hitter for the Dodgers throughout the 90's. 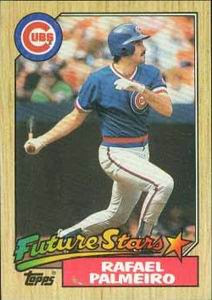 The Dodgers would later trade him to the Cubs along with Mark Grudzielanek, for Todd Hundley, Chad Hermansen and sack of baseballs. Notes: This is the instructional video that gets results! Notes: Say what you want. 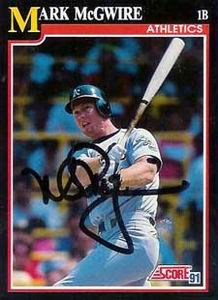 Most folks have made up their mind one way or another regarding McGwire's legacy. But if we're going to have an All-90's team, it would be foolish to not include him. Juiced or not, his HR chase in 1998 was one of the most-watched baseball moments of the decade, and you, me, and everyone else, happily went along for the ride. 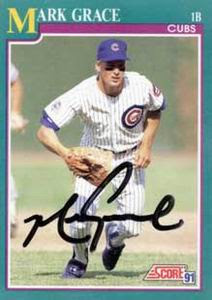 Notes: Check out the old card of Raffy. Despite his meteoric fall from respectability, I do give Palmeiro credit for being one of the very few guys keeping the 80's mustache alive throughout the 90's. While others were working on their Jason Priestley sideburns, or Scott Ian goatees, Raffy was still looking like runner-up in a Magnum P.I. look-a-like contest. Notes: Thomas was one of the most dominate hitters of the decade. 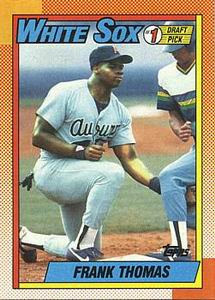 The Big Hurt put up 8 consecutive seasons of 100+ RBI and 20+ HR. Thomas is also the last player to win back to back AL MVP awards. 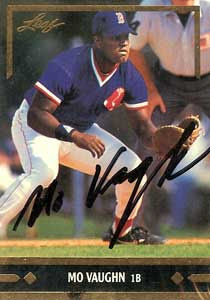 Notes: The only guy that could make Cecil Fielder seem skinny, Vaughn spent most of the 90's crushing the ball in Fenway. Despite being a huge fan favorite in Boston, his relationship with management and some of the local media was rather acrimonious, and after the 1998 season, Mo bolted for Anaheim. Be sure and vote for your choice of first baseman for the TMS All-90's Team. Check out the poll in the left sidebar. Calm Down Thunder. Calm Down.